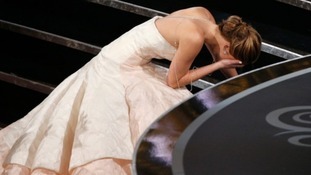 Jennifer Lawrence, who won the Oscar for Actress in a Leading Role, blamed her earlier tumble on her flowing Dior gown. While answering questions backstage afterwards Lawrence said, "What do you mean what happened? Look at my dress! I tried to walk upstairs in this dress, that's what happened". Read more: Jennifer Lawrence takes a tumble at the Oscars. Iranian state television has dismissed the Oscar-winning film Argo as an "advertisement for the CIA". Some Iranians believe Argo, which won the award for Best Picture, portrays the aftermath of the 1979 Islamic Revolution in an unflattering light. Fifty-two Americans were held hostage for 444 days in Iran, but a handful of US Embassy staff were sheltered by the Canadian ambassador. Argo recounts their escape as they used a fake movie as a cover story. Tehran City Council member Masoomeh Ebtekar, one of the students who occupied the US Embassy and acted as the Iranian students' spokeswoman, told the Associated Press that Argo exaggerates the violence among crowds that stormed the compound in November 1979. Mr Ebtekbar said director Ben Affleck "goes and shows scenes of a very violent and very angry mob throughout the film", adding, "It is never mentioned that these are a group of students". The semi-official Mehr news agency called the Oscar "politically motivated" because First Lady Michelle Obama helped present the award, while Iranian culture minister Mohammad Hosseini said the movie has "distorted history". Read more: Daniel Day-Lewis makes Oscars history. 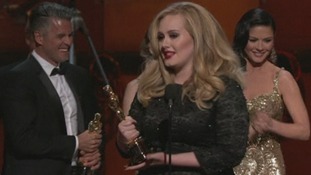 Read more: Adele wins Best Original Song Oscar. The North London based designer said the win was "completely overwhelming" and paid tribute to her children who were "fast asleep in England". The Achievement in Costume Design Oscar was Jacqueline Durran's first win, although she's been nominated twice before - in 2006 for Pride and Prejudice and in 2008 for Atonement. Coincidentally, all three of her nominated films have been directed by Joe Wright and starred Keira Knightly. Durran's period costumes for Anna Karenina also took home awards at last week's Costume Designer Guild Awards and the BAFTAs earlier this month. Although the film was set in the 1870s, Durran consulted the elaborate 1950s-era couture gowns of Christian Dior and Christobal Balenciaga for inspiration, and was largely favoured by the fashion industry to take home Oscar night's top costume prize. Daniel Day-Lewis on his role: "It had a paralyzing quality that if we got it wrong, I might never show my face in this country again!"